Employment activity remains strong, but recruiting qualified workers remains a major challenge. Overall confidence remains high going into the second half of 2018. 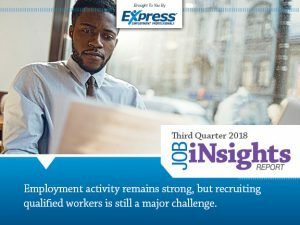 The economy continues to hold strong with the vast majority of respondents expecting an upward trend in employment activity or to at least maintain current levels during the third quarter of 2018. 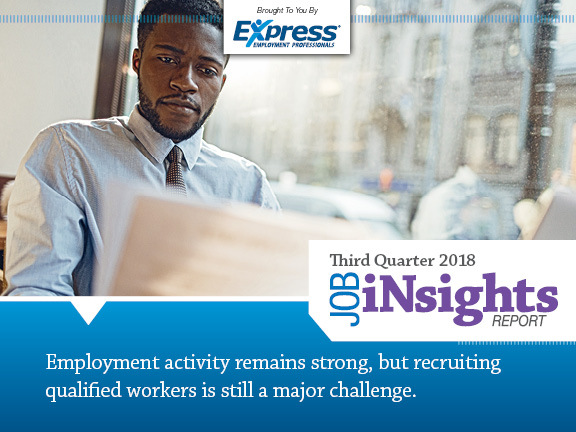 In fact, only 9% of companies expect employment activity to trend down during the third quarter, compared to 47% of companies that expect employment activity to trend up in the third quarter—a 4% increase over second quarter 2018. There’s no end in sight for the ongoing talent crunch. Although business is booming for many companies, recruiting the top talent needed to maintain productivity is becoming more competitive than ever before. In fact, the number of respondents who reported the lack of available applicants as the top reason jobs go unfilled increased by 78% quarter over quarter. Additionally, fewer than one-quarter of respondents said all their positions are filled. In fact, the number of businesses that say it is “somewhat” or “very” difficult to fill positions has increased by 22% since the first quarter of 2017. In many ways, the strengthening economy is a double-edged sword. The energy and excitement of an increase in business activity coupled with a tight labor market means companies will need to be more proactive than ever to recruit and retain the top talent they need to stay productive. In a job-seeker’s market, skilled workers can be more selective. Opportunities abound for skilled workers. In many job markets, the pool of applicants with the right mix of experience and expertise is drying up and the competition among businesses to recruit top talent is fierce. The most qualified candidates have more freedom to be selective about which jobs they accept.